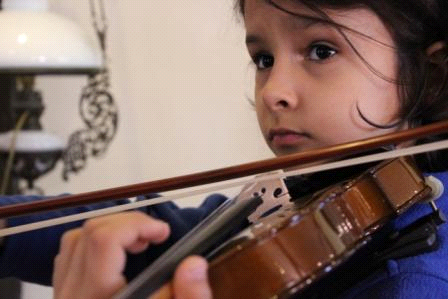 People will tell you that the violin is one of the most difficult (if not the most difficult) instruments to play. They will then try to put you off the idea of your child learning the violin with tales of students sounding like they are “sawing cats in half”! I am not going to say that the violin is easy: it isn’t. But what I will say is that every student – even a beginner – can make a beautiful sound. Learning to play any instrument is a challenge – and I definitely believe it is a worthwhile one. One of my favourite quotes is from Paul Rolland’s book The Teaching of Action in String Playing, where he says: "I think teachers have to decide: are you going to teach a student to play a tune, or are you going to teach him to play the violin? 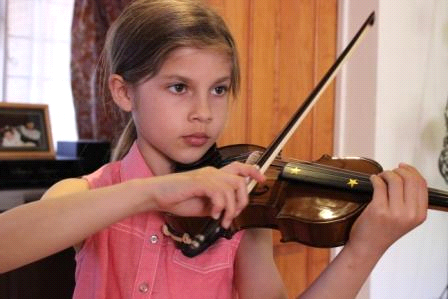 I much prefer to teach the student to play the violin." I am passionate about teaching children to play the violin – not just tunes – and for every beginner to produce satisfying sounds from the very first lesson. I have been teaching the violin for over 20 years, from beginners to grade 8, and welcome new students at every level. My teaching incorporates the ideas of Paul Rolland, Sheila Nelson and Géza Szilvay. one individual violin lesson (30 minutes, preferably on a weekday). one violin ensemble class (30 minutes, on Saturday afternoons). This is not compulsory, but strongly recommended, as manipulating a violin in the early stages is complex, and this input will greatly enhance progress. one Kodály-type musicianship class. This is not compulsory, but strongly recommended. If your child is under the age of eight, I recommend that he/she attend the Stepping Notes classes for the under 8s until completing that curriculum, as it provides essential backup in the development of his musicianship. 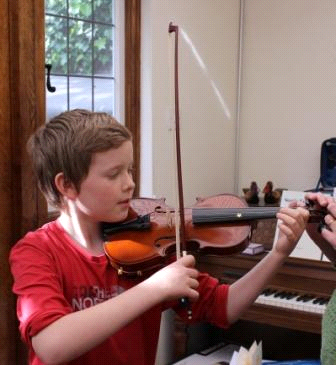 For children over the age of 8, we run a musicianship class on Saturday afternoons. For more experienced players, I suggest one individual lesson per week of either 30, 45 or 60 minutes duration, depending on age and level. It may also be appropriate for more experienced students to join one of the ensemble classes on Saturday afternoons. All lessons and classes take place at my home in Shepperton. Age: I am happy to teach children from the age of six upwards. Regular practice is essential. Beginners must commit initially to 10 minutes’ daily practice (and this really does mean every day!) for the first six months, in order to establish violin playing as part of daily life. After this, daily practice will gradually increase to 20, and later 30 minutes. 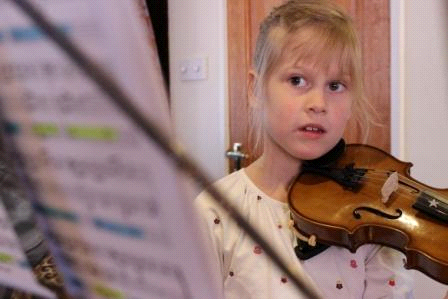 (More experienced students practise between 45 and 60 minutes a day.) For children aged 10 and under, a parent must attend every lesson, take practice notes, and commit to working with their child during their daily practice. While your child is still young, he/she will need your patient, consistent and informed involvement in his/her work in order to progress well. If you are interested, please do contact me for further information. Angela Dally studied violin with Nannie Jamieson at Chetham’s School of Music, and with Jack Glickman at the Guildhall School of Music and Drama. She worked as a violin teacher on the Tower Hamlets String Project, led by Sheila Nelson. Over the past 20 years she has taught violin for Hertfordshire Music Service, Richmond Music Service and Bishopsgate School, and in 2001 devised and delivered the string programme for ACS Egham International School, as well as building her private practice. Since 1997, Angela has taught beginners using the Colourstrings method, created by Géza Szilvay. She is a member of the Incorporated Society of Musicians, the British Kodály Academy and the European String Teachers’ Association. In the hope of defeating e-mail address harvester programs, the 'at' symbol in the address above has been replaced by two other symbols.